To make dental care more accessible, some schools are bringing dentists to students. The goal is to make dental care more accessible for low-income families. The obstacles to care aren't limited to cost. "A lot of times in these families dental care is not a priority," says Galemore. "It's not that the parents wouldn't want to provide it, but they maybe can't miss work to take their child to the dentist, [or] they may not have transportation." A lack of preventive dental care for poor children is a national problem. Medicaid and the Children's Health Insurance Program, which cover children from low-income families, both pay for dental services. But fewer than half of children and teens enrolled in those programs received a preventive dental service last year, according to Stacey Chazin, a public health specialist with the Center for Health Care Strategies. The participating schools in Olathe, a suburb of Kansas City, Mo., are among a few hundred across the country that offer oral health care. "What's nice about the schools is [they're] a place where students already go on a regular basis, whether it's back to school night, or it's a meet-the-teacher, or to pick up or drop off their kids," says Chazin. In some schools, dentists provide care. In others, dental hygienists perform preventive services. In a recent policy brief, Chazin recommends school-based oral health care as an important children's health strategy. 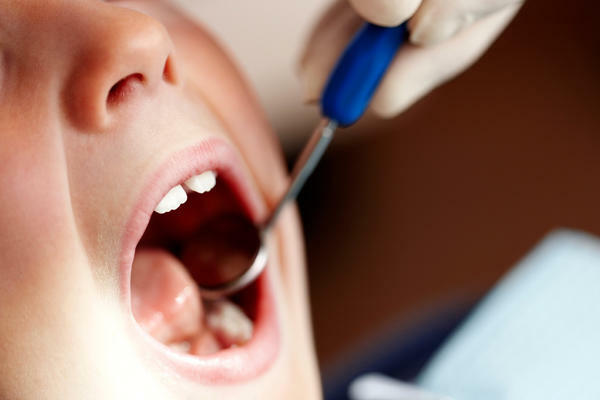 And, as it turns out, the federal government set goals to increase the proportion of children enrolled in Medicaid and the Children's Health Insurance Program receiving any preventive dental service by 10 percent between 2011 and 2015. Tooth decay is the most common chronic disease among American children, according to the American Academy of Pediatrics. Some 25 percent of children ages 5 to 19 who live at or below the federal poverty level had untreated tooth decay, according to data from the Centers for Disease Control and Prevention. Only 12 percent of children with family incomes double that of poverty level had untreated tooth decay. According to Chazin most school-based oral health programs focus on preventive services like cleanings, fluoride varnish and sealants – protective coatings placed over molars to prevent cavities. "The hope in all of it is that they're referred to, and begin to get care from a dentist, where they would subsequently go for regular preventive visits and any needed treatment," says Chazin. Medicaid and CHIP keep tallies of services performed at schools, when they are billed. But it's difficult to know if parents are scheduling those follow-up dentist visits. That data are hard to track, and to Chazin's knowledge, no insurers or state health departments are taking the time to do it. Olathe however, does have data on follow-ups. And that helped push the district to take the idea of in-school dental care one step further than most schools. At the start in 2009, the district tracked the number of follow-up appointments scheduled with dentists. The results weren't good. Of the 339 children treated in school by dental hygiene students from the University of Missouri-Kansas City, 63 percent had tooth decay and were referred to a dentist. By the end of the school year, only 11 percent of those referred had had their parents contact a dentist's office to schedule an appointment. But when a clinic in town became a federally qualified health center in 2013, it opened up a new opportunity. The district now works with the clinic—which receives federal funds to provide free or low-cost care to the underserved-- to bring dentists to the schools. These dentists perform the full array of services on site. It's a win-win for the school district: Nurses no longer have to worry about parents scheduling follow-up visits, because they are scheduled at school. And the clinic provides a steady source of funding for the district's growing number of immigrant students, some of whom don't qualify for insurance because of their undocumented status. If a student has no insurance, the service is free. "We used to think, 'Oh, schools shouldn't do this.' We thought our job was to provide the education for the kids," Galemore says. "We didn't used to feed breakfast to kids at school either. Funding has been cut and cut and cut for schools, but it's part of focusing on the whole child. We know if we have better health for that child there's better learning." For this school year, the oral health program in Olathe is expanding from 10 to 12 elementary schools, and adding two high schools. This piece comes from Side Effects Public Media, a public radio reporting collaborative that explores the impacts of place, policy and economics on health. Follow Side Effects on social media here.